We start the evening by driving along the Ringstraße on our way to the Viennese amusement park, the Prater. A ride on the Giant Ferris Wheel will give you a marvellous view over the city. 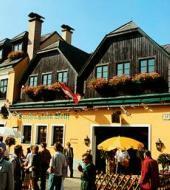 Then we drive through the wine tavern village of Grinzing to Neustift am Walde, where the artists of the 1st Viennese Heurigenshow will entertain you with a selection of famous waltz melodies, polkas and romantic arias & duets from popular operettas! A good evening meal including 1/4 l liter of wine together with the unique atmosphere at the wine-tavern and you´ll certainly need nothing more to set you back into the 19th century. Price includes ride on the Giant Ferris Wheel, Heurigenshow with dinner. If the Giant Ferris Wheel is closed we invite you to a drive up the Cobenzl hill and a glass of sparkling wine. This tour is available in German, English, French, Italian and Spanish. Please arrive 15 minutes prior the tour. This tour starts at 19:15. If the Giant Ferris Wheel is closed we invite you to a drive up the Cobenzl hill and a glass of sparkling wine.